﻿Bruce Goodman's "Jack and the Beanstalk"
Jack’s mother was absolutely skint, except for the cow of course which was dry and she didn’t have a freezer back in those days to freeze the meat. 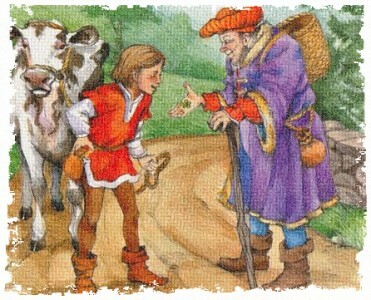 Jack took the cow – it was brown and white – and headed for the market. On the way he met an old man who offered him a handful of beans in exchange for the cow. Jack took them, grateful that he didn’t have to walk all the way to market. And she did that. It lasted for only one meal. Oh! If only she had angrily tossed the beans out the window! What a difference it would have made to their lives!